SANTA FE SPRINGS >> Santa Fe High School, with five regulars hitting above .300, is one of the better hitting teams in the Del Rio League. 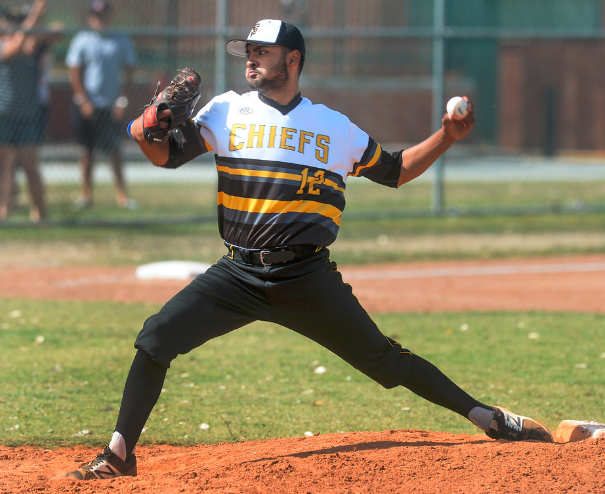 But the Chiefs ended the week atop the league baseball standings due to their pitching.Alfredo Ruiz and Jonathan Fuentes combined to pitch Santa Fe’s second consecutive shutout, leading the Chiefs to a 3-0 victory over La Serna on Friday at Santa Fe High. Isaiah Gonzales tossed a six-hit shutout over the Lancers on Wednesday. Ruiz threw six scoreless innings and struck out nine for Santa Fe (14-12, 9-2), which leads California (15-7, 8-3) by one game and La Serna (12-14-1, 6-5) by three. The Lancers’ Luke Garcia had three hits and Andrew Arguello gave up four hits and struck out five in six innings. Santa Fe, which scored two unearned runs in a 3-0 win over La Serna on Wednesday, took a 2-0 lead in the second. The Chiefs loaded the bases on a hit-by-pitch to Anthony Montes and consecutive singles by Erick Espinoza and Ruben Romero. Sergio Medrano was then hit by a pitch for a 1-0 lead before Jorge Centeno hit into a fielder’s choice for a 2-0 lead. Alonso Guzman homered in the third for a 3-0 advantage. Ruiz got in a little trouble in the fifth and sixth, but pitched his way out of it. Richie Perez doubled with one out, but was left at third after Ruiz induced Jacob Mora to line out to right field before striking out Eli Martinez. Josh Valdez doubled and Nick Martinez singled with two out in the sixth, but Ruiz struck out Diego Perez. Notes: Title race is down to Santa Fe and Cal. Chiefs close with Pioneer and El Rancho; Cal has has La Serna and Whittier. Notes: Montebello faces Alhambra twice next week, which could solidify the title for the Oilers, or make it more complicated, if Alhambra pulls the sweep. Stay tuned. 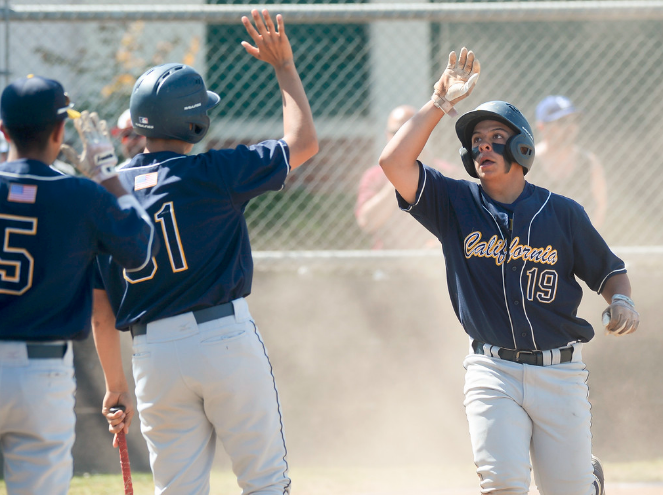 OTHER AREA NOTES: Cantwell-Sacred Heart of Mary leads the Camino Real League by two games over Bishop Montgomery. 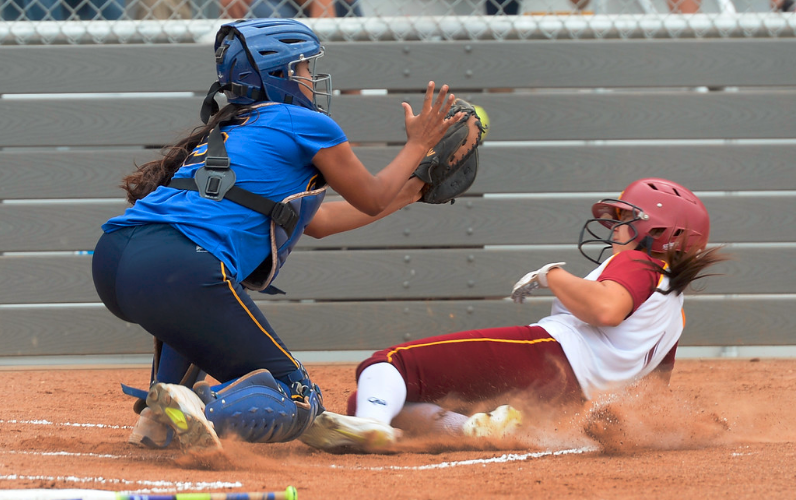 The two face each other twice on May 8 and 10….La Mirada routed Norwalk, 17-0, to improve to 19-4 overall and 8-0 in the Suburban League. They face second-place Mayfair (7-1) twice next week. California catcher Jaclyn Macias (5) tags out La Serna’s Gianna Alvidrez (1) at home plate in their Del Rio League girls softball game at California High School in Whittier on Thursday April 27 2017. La Serna rallied for a 5-4 win. WHITTIER >> Traditional-power programs such as the La Serna High School softball team didn’t reach their elite status without the ability to sidestep obstacles.The Lancers proved the point on Thursday.Astrid Arevalo’s two-run single keyed a three-run seventh and reliever Gianna Alvidrez shut down a rally in the bottom of the inning to help La Serna to a 5-4 victory over arch-rival California in a Del Rio League game at Cal High. Arevalo had two hits and three RBIs and Jasmine Gray had two hits for the Lancers (19-5, 6-0), who lead the league standings by two games. Miranda Rooney and Sarah Duran each had two hits and an RBI for the Condors (17-9, 3-3), who fell into third place with the loss. “No matter how much we’re losing by, we just want to keep hitting,” Arevalo said. “We want to keep playing defense. We just want to keep fighting. Sweeping their arch-rival is just added pleasure, as is coming from behind. But Thursday that enjoyment looked bleak with La Serna trailing 4-2 heading into its final at-bat. But the Lancers showed again they are never out of a game. They loaded the bases on a lead-off walk to Kayla Carrillo, a two-out walk to Skylar Sethman and a single by Gray. Arevalo, who tied the score at 2 with a triple in the sixth, lined a single to right field to score Alvidrez, who reached on a fielder’s choice, and Sethman, with Gray coming home on an errant throw to the plate. The Condors didn’t go quietly into the night. Nautica Rivera led off with a walk. Alvidrez then replaced starter Naomi Dickerson. She gave up consecutive walks to load the bases. But Alvidrez ended it by striking out Marissa Montesdeoca and inducing Rooney to ground out. It was all bad for the Condors, who took solace in that they rebounded from a 12-0 loss to La Serna on April 11 to bring them to the brink on Thursday. WHITTIER >> La Serna High School got the best of Santa Fe earlier this baseball season and pitcher Isaiah Gonzales was determined it wouldn’t happen again.He was true to his word on Wednesday.Gonzales pitched a six-hit shutout and the Chiefs took advantage of four La Serna errors to solidify their lead in the Del Rio League with a 3-0 victory over the host Lancers. Santa Fe (13-12, 8-2), which shared the league crown with California last season, moved two games ahead of La Serna (12-13-1) and a game ahead of Cal (14-7, 7-3), which beat El Rancho 7-2 in its chase for back-to-back titles. Anthony Montes had a RBI double for the Chiefs. Abraham Carrillo was the hard-luck loser for La Serna, giving up three hits and striking out five in 5 1/3 innings. Nick Martinez also had two singles for La Serna. “This was very big, because the first we game we played (against them) they gave it to us,” Gonzales said of La Serna’s 12-2 win on March 24. “They are a good ball club, but today we came out with more fire and it lit a spark under us. Santa Fe, which split two with Cal last week, took the early lead by taking advantage of two La Serna errors in the second. Alonso Guzman reached on a dropped pop up with one out. Montes then lined a RBI double to right-center field for a 1-0 lead. He advanced to third on the throw home. Montes scored on an errant pick-off attempt for a 2-0 edge. “(Carrillo) pitched great,” La Serna coach Anthony Gonzales said. “He’s done it all year for us. He put us in position to win, but we have to step up for him one time. Isaiah Gonzales was solid, giving up the six hits and striking out five. He allowed just two runners to reach third base and three to advance to second. He got out of both situations before closing the game by retiring seven of the final eight batters, with the exception reaching on an error. La Serna’s only two looks at the game came in the third and the fifth. In the third, the Lancers put runners on first and third with one out following a single by Jacob Mora. But Gonzales induced Eli Martinez to hit into a double play to end the threat. The Lancers had runners on second and third with two outs in the fifth before Gonzales got Mora to pop out. Gonzales had a single and scored in the sixth for a 3-0 lead. The two teams complete their season series on Friday at Santa Fe. SANTA FE SPRINGS >> California High School’s quest for a sixth consecutive Del Rio League baseball crown is still alive and well.The Condors drew their line in the sand by rallying back from a tough loss on Wednesday to score a 7-4 victory over first-pace Santa Fe on Friday.Gilly Rodriguez had a key two-run double in the second inning and Gilbert Lopez gave up one run in five innings to lead California (13-7, 6-3), which stayed within a game of the Chiefs. Raul Ramirez had three hits for Santa Fe (11-11, 7-2), which faces a home-and-home series with La Serna (12-12-1, 6-3) next week. The Lancers lost to Whittier to stay tied for second with California. California, which lost 5-0 to Santa Fe on Wednesday, jumped on the Chiefs early on Friday, leading 5-0 after two innings. The Condors took a 2-0 lead in the first. Jacob Sharp and Brandon Acosta (two hits, two runs) singled with one out. Sharp then stole third before scoring on an error. Acosta came home on a squeeze bunt by Lopez. Jordan Zuniga led off the second with a single before scoring on a fielder’s choice and throwing error. Rodriguez doubled in two runs for a 5-0 advantage. 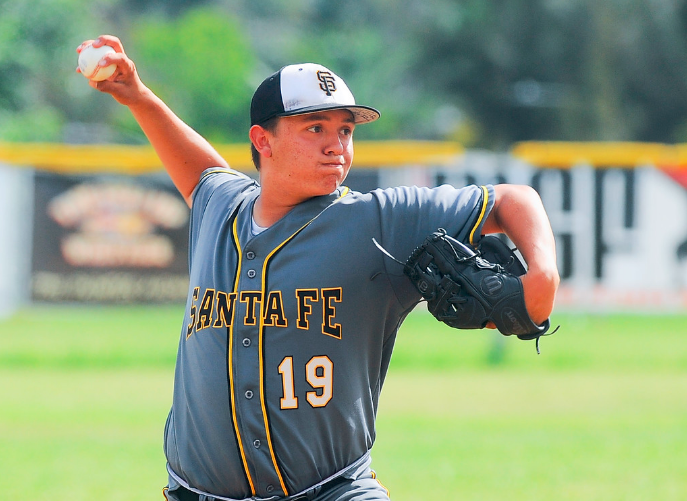 Lopez kept Santa Fe at bay early, allowing just one unearned run in five innings. He gave up five hits and struck out three. California made it 6-0 in the third on a single by Lopez and a balk before going up 7-0 on a hit-by-pitch, a stolen base and error in the fifth. But Santa Fe, which scored five runs late to win on Wednesday, refused to quit. Ramirez hit a two-out triple to make it 7-1 in the fifth before the Chiefs made it 7-3 in the sixth on a RBI single by Ruben Romero and an error. Ramirez hit a double in the seventh before a fielding error made it 7-4. But Anthony Salazar induced Nathaniel Davalos to fly out to end the game. “We gave in a little bit early with letting (being in first) get to us. We came in a little too laid back,” Santa Fe coach Pierre Romo said. “It affected us and we got down on ourselves. But we continued to fight. LA HABRA >> La Habra High School has been rated one of the top 20 softball teams in the state all season and Thursday they lived up to that billing.Janelle Rodriguez hit two home runs and Hannah Johnson threw four shutout innings to lead host La Habra to a 12-0 victory over Fullerton in a Freeway League game that was stopped in the fifth inning because of the 10-run rule.Maritza Diaz, Anissa Alatorre and Johnson also hit home runs for the Highlanders (14-6, 4-0), who are ranked No. 20 in the state by MaxPreps.com, No. 8 in CIF Southern Section Division 1 and No. 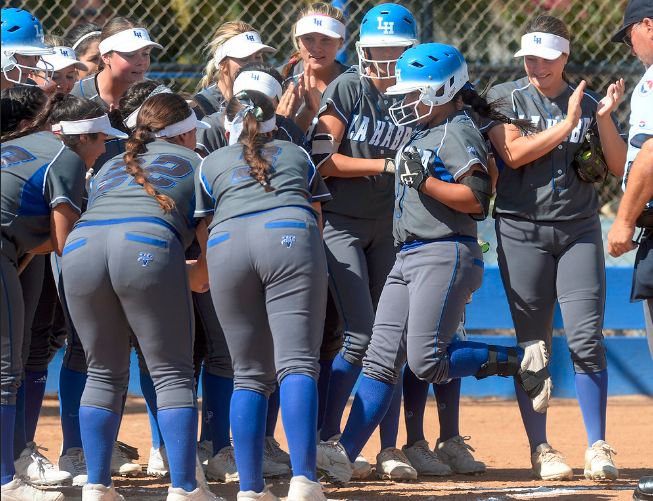 1 in the area.Kira Cauley, Rodriguez, Diaz and Savannah Tourville had two hits each for La Habra. Alyssa Brundage and Ceci Lopez had singles for Fullerton (10-10, 2-2). “We just had to be patient today,” said Rodriguez, who was the 2016 Whittier Daily News Player of the Year. “We talked about not being anxious at all. It was our main goal today. La Habra put it away early, leading 7-0 after scoring two runs in the first and five in the second. Rodriguez, who had four RBIs, highlighted the early uprising with a three-run home run in the second for the seven-run lead. She led off a four-run fourth with her second home run for a 9-0 lead. Alatorre capped the scoring with a two-run home run for a 12-0 lead in the fourth. Alyssa Palacios also had a triple in the inning. She went 1 for 2, with a sacrifice fly in the first. Johnson, who gave up one hit and struck out three in four innings, was perfect through three. She got the first two outs in the fourth before Brundage singled to left. Elena Valenzuela and Rodriguez got the final four outs.